The efficiencies and energy demands of the nitrification and denitrification phase during the purification process will depend on how well the aeration control system is performing – the aerator equipment is the biggest consumer of energy in a biological wastewater treatment plant. While it is commonly known that nitrifying bacteria (used to convert ammonia to nitrate) require dissolved oxygen, higher concentrations of oxygen will have no effect on the pace of degradation, but end up requiring far higher energy to run the oxygen blowers. 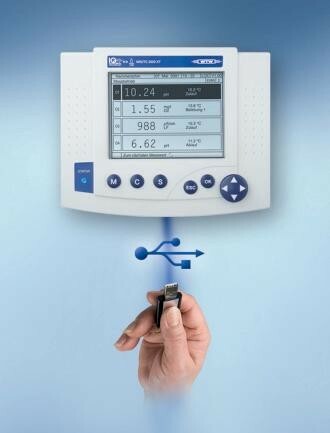 Furthermore the online measurement of the selected parameter of ammonium – which provides the possibility of an NH4-N controlled operation – makes the nitrification process transparent and offers significantly higher potential for energy saving than in a pure O2 controlled operation. A combined measurement of NH4-N and O2 is suitable for plant operation, as this prevents the formation of bulking sludge in the lower range and limits the oxygen input should interferences occur in NH4-N decomposition (e.g. caused by a disturbed nutrient ratio of carbon : nitrogen : phosphate). This can create significant savings potential as the detected minimum in ammonium concentration occurs prior to the rise in O2 being detected. Keeping aerator operations to a minimum to reduce energy costs requires precise on-line measuring instruments to ensure efficient and energy saving control of the process. The modular WTW IQ Sensor Net water quality control system (2020 XT) lets engineers add more modules or sensors at any time, while continuously measuring water quality anywhere in the facility for best process control.